People with severe facial blushing understand the challenges it can pose in day to day life, including embarrassment and anxiety in social situations. Facial blushing is another manifestation of an overactive sympathetic nervous system. Sympathetic blushing results in intense bursts of facial redness as a result of social functions or stress. Often patients will have elements of facial blushing in association with hyperhidrosis but often it can occur as an isolated problem. People who experienced severe facial blushing often complain of blushing that occurs not only on the face but also the neck and upper chest during stressful situations, such as public speaking or job interviews. It often comes on quickly with no warning, and can be very debilitating, resulting in severe social anxiety and avoidance behavior. Even though everyone experiences some form of blushing from time to time, severe facial blushing is quite different. Because it is something that everyone experiences, it can be easy to downplay the physical and psychological effects of chronic facial blushing conditions. Facial blushing is not a small matter. If left untreated, facial blushing can be debilitating and limit people in all aspects of life including work, family, and social matters. If severe facial blushing is having a negative impact on your quality of life, it’s important to see a doctor to discuss treatment options, including endoscopic thoracic sympathectomy (ETS) surgery. When you consult with a doctor about facial blushing, he or she could recommend conservative treatment methods before ETS surgery to see if results are satisfactory. Conservative methods for facial blushing treatment could be oral medications, including beta-blockers to reduce the body’s sympathetic response. In some patients, anti-anxiety medications can be effective to reduce stress responses that can trigger blushing. 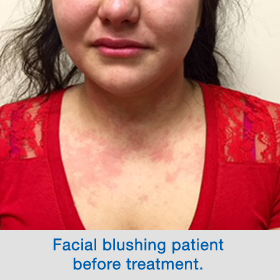 Although results vary patient to patient, often times conservative therapies for severe facial blushing are ineffective or do not yield satisfactory results. If conservative methods for reducing facial blushing fail, experts may suggest ETS blushing surgery. At the Center for Hyperhidrosis at Columbia University Medical Center we have an extensive history with ETS blushing surgery. 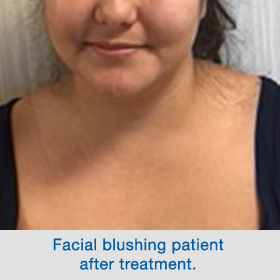 There is a unique subset of patients with facial blushing who do extremely well following T2 sympathectomy. A typical patient has a fair complexion and exhibits patchy/blotchy erythematous patches over their upper chest neck and face which comes and goes in stressful embarrassing situations. The ETS–T2 sympathectomy is done in a similar fashion as for palmar hyperhidrosis. The procedure involves two microscopic incisions placed in the armpit, through which we place a small camera, that allows visualization of the entire chest and the sympathetic nerve. We use CO2 insufflation, which gently compresses the lung, and therefore the lung is not deflated. 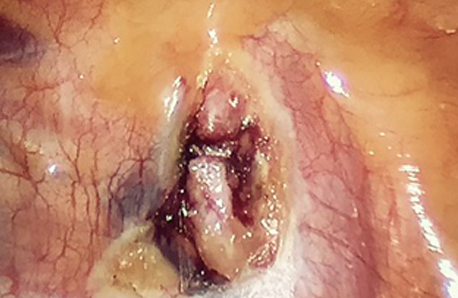 The T2 ganglion is separated from the sympathetic trunk along the superior aspect of the second rib. At the Center for Hyperhidrosis at Columbia University, we have developed a surgical technique that avoids touching or disrupting any of the microscopic sympathetic fibers emanating from the stellate ganglia, which we believe may be responsible for autonomic innervation of the heart, and other thoracic organs. 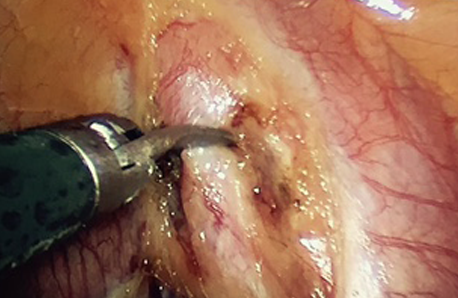 By doing so, we perform a sympathectomy that eliminates facial blushing and prevents some of the other autonomic side effects such as bradycardia or severe compensatory sweating that can be associated with T2 sympathectomy. After completing the procedure, patients should expect to be discharged home after several hours. We have recently reviewed our results of T2 sympathectomy for patients with facial blushing. With an average follow-up of over one year, the results are excellent. Over 90% of patients feel that ETS-T2, has dramatically improved their blushing, and has not resulted in any side effects.